Some of my earlier work was devoted to the study of the argument structure of verbs, and helped establish the hypothesis (known as the "unaccusative hypothesis") that the apparent subject of certain verbs (like fall, exist) is in fact the object in argument structure. That work shed light on the patterns of case marking and auxiliary selection in some of the Romance languages. 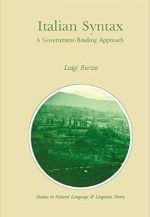 One of the factual observations made in that work later became known in linguistics as "Burzio's generalization". Other work has been devoted to the principles controlling the expression of pronominal coreference. It argues that in choosing an element to express coreference, options are organized according to the hierarchy reflexive > non-reflexive pronoun > name. This hierarchy reflects a principle of economy of referential expression, as reflexives lack any independent reference, while names have full independent reference and pronouns lie in between. In a structure like John saw himself/ *him, this principle will impose the reflexive pronoun (the referentially most parsimonious), excluding the non-reflexive pronoun him (when read as coreferential with John). The same principle will also impose the (more parsimonious) pronoun him in He thought that Mary saw him/ *John, hence excluding the name John (when read as coreferential with he). Other principles sensitive to the structural distance between a pronominal and its antecedent will sometimes independently exclude the reflexive option, as in the last example, where himself would be barred, hence inducing selection of the non-reflexive pronoun --the next best choice. Beside the above hierarchy, the work in question identifies several other hierarchies which appear to hold language-universally. These concern the structural distance just alluded to, and the conditions under which reflexives can felicitously agree with their antecedents. In one further line of research, I have studied the patterns of morphological case. I have argued that the apparently "naive" view of traditional grammar that case (Nominative, Accusative, Dative, etc.) simply encodes grammatical relations (subject, direct object, indirect object) turns out to be surprisingly correct. That view is generally taken to be false in contemporary work in light of certain counterexamples, such as I expect him to leave, where him is demonstrably the subject of leave and yet bears Accusative Case. What makes this reappraisal possible is understanding the grammar as an optimization system (as in Optimality Theory, see below) rather than as a system of inviolable conditions (a view also entailed by my work on pronominal coreference). Apparent counterexamples to the naive view can be reduced to principles acting under specific circumstances, that overcome the more general association of cases and grammatical relations. The latter association is thus only a violable condition rather than a false one. While I remain interested in issues of syntactic theory such as those just described, in recent years I have turned to the area of phonology and word structure (morphology). 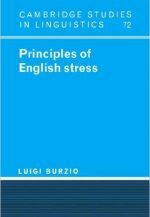 My book Principles of English Stress (Cambridge, 1994. ASIN 0-521-44513-2) offers radically new solutions to a number traditional problems of English morpho-phonology, such as vowel length allomorphy, as in divi:ne/ divinity; obli:ge/ obligatory; genera:te/ generative, fi:ni:te/ infinite; Elizabeth/ elizabe:than (where colons mark long or diphthongized vowels), and the distinction between re-stressing and non-restressing suffixes, as in párent/ parént-al (re-stressing) versus américan/ américan-ist (same stress). Those solutions rely on a constraint-based approach to morpho-phonology which I have proposed in that work, and which has subsequently converged with the "Optimality Theory" of Prince and Smolensky (see Articles D, H). See 'Recent and Ongoing Work'.